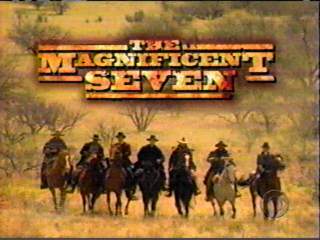 In 1998, The Magnificent Seven first aired on television as a weekly series. Based on the 1960 movie starring Yul Brynner and Steve McQueen, the series chronicled the lives of seven men hired to protect a fledgling town in the post-Civil War West. While the series itself only lasted two seasons, the second of which was made possible by an Internet campaign launched by fans, the spirit of The Magnificent Seven has lived on. Many websites have been dedicated to the series, its actors and its stories, and those fans who keep it alive have become a family of sorts. The Magnificent Seven is the story of a group of men pulled together by unusual circumstances who soon learn that they share common bonds. Fans of The Magnificent Seven have learned the same thing. It is an adventure to ride with The Magnificent Seven. I invite you now to join the ride. RIDE WITH THE SEVEN AGAIN! The Nashville Network is currently airing the episodes on Wednesday evenings. Check the schedule for times. MGM reports that the episodes will "soon" be released on videotape as well. A Martinez - Site for the man who guest starred as Rafael in "Love and Honor"